I have Heddman headers on my 80 Cutlass and the instructions said to use a PF24 or equivalent filter which is the same one all the older BOP engines used. Its shorter than the original PF61 filter so it fits above the collector has the same threads and is larger around so your not losing any filtration capacity over the original. I am still fighting to get a yard sent of anything clost to Maple headliner cloth. I have cleaned up and painted the engine compartment. Cleaned and painted the headers with black grill paint. Laid the headers in on the sides and reinstalled the 307, bolting up the engine mounts. I did a lot of work on the interior, recoloring all the plastic I had removed and touching up the chrome. It looks great. Ive got it almost all installed excepting the ceiling and door jamb pieces. Today I disassembled the 2004r and ordered rebuild parts. 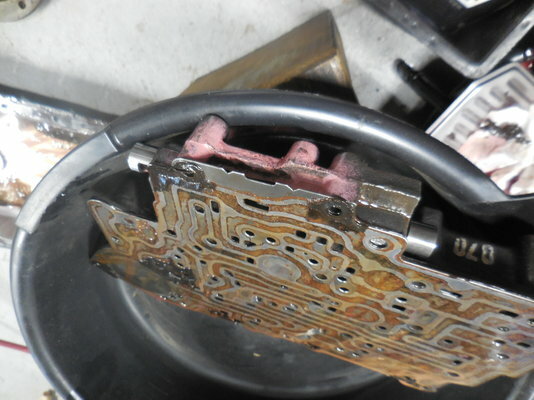 A few clutches were flaking apart, and all of them were pretty worn. Definitely got to it just in time. I will be adding a 10 vane pump w hardened rings, big boost valves, a hardened spine stator support, and then all the normal rebuild clutches, steels, seals, rings, bushings, washers, etc etc. Im in a rush so no pics at this time. I will update later. Looking forward to DRIVING! This reinforces my thought that the Maple red is just a forgotten interior color for our cars. It was used in B & C bodies but no one seems to have the correct/nearest correct shades & material for it. I've been dealing with this since before a few of our members were born. Not to piss on your parade, but when I tried grill paint,it turned chalky. I've had better luck with VHT. Even chalky headers will be an improvement over the rusted crap peeling chrome that was on there before. but yes, VHT makes a great product I agree. I rebuilt the transmission front pump today, no problems there. Hardened stator support and pump rings installed with 10 vane pump. The old Orings were so hard and brittle … definitely time to be replaced. I did notice that the green thrust washer behind the pump had begun to be eaten away by the hard part behind it. Little green bits everywhere. 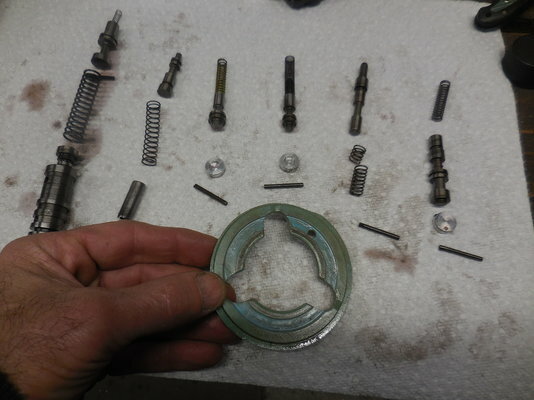 I will pay a lot of attention to selective washers and proper clearances on reassembly. I them moved on to the valvebody (pink paint - hi po valvebody). It was quite dirty inside and the separator plate shows some rusting from the water that was in the fluid. More importantly, I disassembled it entirely so I could put it all in the ultrasonic tank to clean, and I found that the 3-2 spring had broken (2nd from right in pic). So I guess I will pull one from the spare 2004r trans I have in the garage. What do you think? Is it worth throwing a transgo shift kit in this valvebody or let it ride as is? Any Idea who makes the Carquest filter? Should be a good filter. 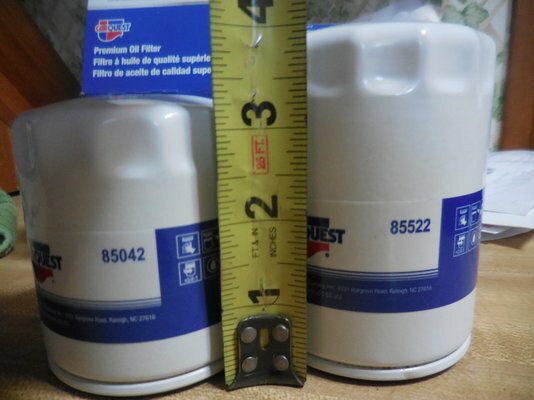 Looks like WIX makes the Carquest filter. Interesting filters, both the skinnier filters but one taller. The VHT stuff covers very good and holds up well. But I have had issues with the nozzles plugging up. A lot of the better paints are so thick, they plug easier. I wonder if they were Flowtech ceramic coated? Mine peeled and pinhole rusted plus where they peeled within a year. All depends on how you like your auto transmissions to shift. I like mine to shift noticeably firm so personally I would put one in if it were mine along with a billet servo. At a minimum I would use a .500 boost valve assembly with a corresponding stiffer pressure regulator spring to raise line pressure wich generally translates into higher friction clutch capacity and a billet servo which will reduce slippage of the second gear band and clean up the 1-2 and 2-3 shifts. Transgo does make nice quality kits and can be had with the billet servo included now. I have also had excellent results in the past with the CK performance shift kit and CK billet servo. I cant say what his kits are like anymore as some components may have changed since the last time I bought one. I though Wix was bought by Baldwin or somebody else a few years ago.